Finally no need to compromise quality for price. 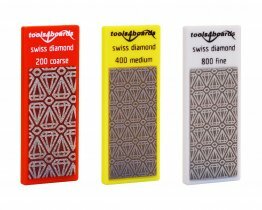 (PRemium + ECOnomy) stones feature premium Swiss-made diamond sheet mounted on exceptionally flat precision injection molded polycarbonate backer. Polishing and deburring ability of a stone combined with the cutting ability of a file. Perfect for touching up edges and removing burrs on-hill or to smooth and polish edges after filing. Color-coded backers make it easy to select the proper grit - Black = 100 x-coarse, Red = 200 coarse, Yellow = 400 medium, White = 800 fine and Blue = 1500 x-fine.